UK and Egypt launch new round of Newton-Mosharafa grants to spark science collaboration. 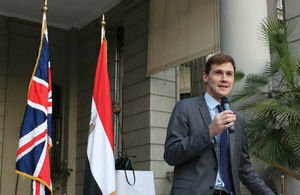 The British Embassy in Cairo, the British Council and the Science Technology and Development Fund have announced a new round of science and research opportunities under the Newton-Mosharafa Fund, the British-Egyptian partnership worth £24m over five years. Applications are now open for the Newton-Mosharafa Fund’s Institutional Links and Researcher Links travel and workshop grant programmes. Under the Institutional Links programme, research institutions and academic departments can apply for grants of £50,000 up to £300,000 over two years to develop scientific research partnerships between Egypt and the UK. Under the Researcher Links programme, early career Egyptian researchers will have the opportunity to take part in academic workshops with their counterparts in the UK or to travel to the UK on study or training visits for up to six months. The Newton-Mosharafa Fund was established in 2014 with the aim of bringing together British and Egyptian expertise in science, sharing cutting-edge research, and deepening partnerships in innovation. Worth £24m over five years, the Fund focuses on five main areas identified as priorities for Egypt’s long-term development: water management, renewable energy, food production, archaeological and cultural heritage, and affordable and inclusive healthcare. The Fund has already given almost 120 Egyptian scientists the opportunity to pursue their academic careers in the UK by studying for PhDs or taking up post-doctoral fellowships. Over the last two years, Institutional Links programme established 20 partnerships between British and Egyptian universities and research centres. Their research projects included programmes to find new treatments for liver cancer, to develop high-efficiency solar energy cells, and to preserve Egypt’s cultural heritage through high-tech imaging hardware. The Newton-Mosharafa Fund is a big, bold commitment – worth £24m over a lifetime of five years – that demonstrates how serious we are, the UK and Egypt together, about building a strong, long-lasting partnership in science and innovation. In fact it is just one element of the UK’s wide-ranging education offer to Egypt. The UK is the education nation and our programmes here include scholarships, English language training, international qualifications, technical and vocational training. It is a top priority for the UK and Egypt to raise up a well-educated, highly-skilled, and innovative new generation of young Egyptians who have the potential to build a bright future for this country. It is a pleasure to announce the start of applications for the Newton-Mosharafa Fund, which is the first of a range of exciting opportunities throughout the year, with PhD places opening up in the summer and Researcher Connect professional development workshops coming in the autumn. The importance of this programme, demonstrated by the extension of funding to it from both the UK and Egypt, is also shown by the exciting research and projects which are already stemming from this investment. This includes work on projects related to topics of vital importance in building a sustainable future for Egypt.